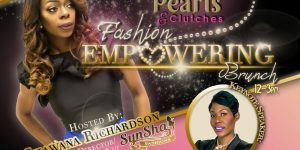 Pretty Pearls and Clutches “Fashion Empowering Brunch” is coming to a city near you. We are delighted to bring you a brunch with a twist, incorporating Fashion and Words of Empowerment. At this event women will be inspire to fulfill their life goals and dreams, either if their dream is to become business owners or become the next leader in Corporate America. Kendall Johnson our Keynote Speaker will deliver a powerful message empowering women throughout the brunch. Kendall T Johnson is an award winning international hairstylist, author and motivational speaker. She is the bestselling author of the book “I Am Not My Circumstance” ranked #4 on Amazon’s best sellers list and released “I AM Success Journal ” helping women successfully set and attain their goals. The Fashion Empowering Brunch will consist of live entertainment; a fashion show from SynSha’ Fashions/ Pretty Pearls & Clutches line, we will honor some of Orlando Influential Women, giveaways, great food and fellowship amongst other women. We believe in the power of women when we all come together to empower, uplift, educate, brunch and shop amongst each other. Pull out your pretty pearls & clutches to come out to have a great time with other women. Pink Carpet Affair dress to impress you will never know who will be in the building! SPOTS ARE AVAILABLE for you to brand your business at our event contact us! Tickets and vending booths are now on sale! Come and hang out with some of the best Business Professionals around. 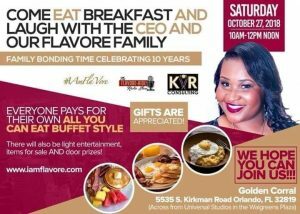 You can eat and network all at the same time. The Cost is FREE to the public. Limited seating in our reserved section. Please bring business cards as well. Hope to see you there!